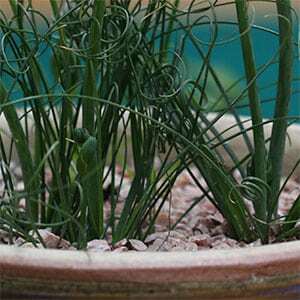 The amazing spiral foliage of Albuca spiralis make this a fascinating bulb. It grows in hot dry climates and the spiral or ‘corkscrew’ leaves are a built in cooling mechanism. The formation the leaves is upright stems with spiral tops, this allows good air circulation, the spirals also all seem to point in different directions so part of the foliage is in shade all of the time. The flower look a little like those of Galanthus in shape, smaller and green with yellow edges. 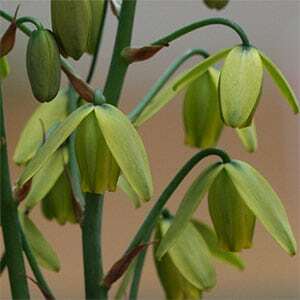 Albuca spiralis can be grown in a container and it is an easy plant. This is a winter growing plant with summer dormancy. Best planted in a container and in full sun to a little afternoon shade. Bulbs are planted with the top at surface level. A dry dormancy is essential to prevent bulbs from rotting. The variety ‘Frizzle Sizzle’ is said to be a slightly easier to grow plant, discovered in Holland. Over watering and/or low light will cause the foliage to loose some of its spiral look. Easy by division of bulbs, also possible from seed. Common Names – Corkscrew Albuca, Frizzle sizzle plant. Flowers – Green with yellow edges.. Frost tolerant – Very light frost only.